Located at a height of 12,000 feet above sea level, the undulating meadows of the Valley of Flowers is home to a wide variety of indigenous alpine flowers. Orchids, marigolds, primulas, poppies and many other such flowers carpet the floor of the valley. This picturesque landscape is also the habitat of several endangered species of animals such as the Asiatic black bear, snow leopards and musk deer. 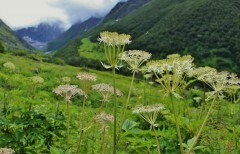 Largely unknown to the outside world until 1931, today the Valley of Flowers trek is not only a great attraction for trekkers but also has tremendous ecological significance. 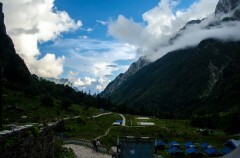 • Explore the wee Himalayan village of Ghangaria and its surroundings. • Absorb the enchanting beauty of the Valley of Flowers. • Trek up steep slopes to the icy Hemkund Sahib. 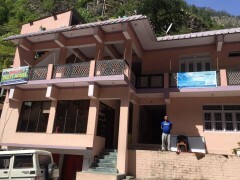 • Walk around the picturesque town of Joshimath. For cancellations made 24 days or more before departure of the Valley of Flowers trek: 95% refund. For cancellations made between 14-23 days before departure of the Valley of Flowers trek: 70% refund. 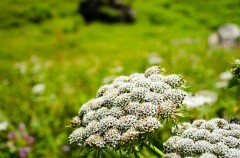 For cancellations made between 8-13 days before departure of the Valley of Flowers trek: 50% refund. For cancellations made less than 7 days before departure of the Valley of Flowers trek: No refund. You'll be picked up from Haridwar railway station early in the morning. The drive to Govindghat will take 8 to 9 hours. You will pass through the holy city of Devprayag, at the confluence of the Bhagirathi and Alakananda rivers. You will reach Govindghat by evening. You will spend the night taking rest and preparing for the trek the next day. Overnight at Govindghat in hotel. You'll trek up along a well maintained pilgrim trail to Ghangaria. It is a 14 kms trek and is pretty easy, except for certain stretches of moderately challenging uphill climbs. It will take you about 4 hours to finish this trek. Overnight at Ghangaria in hotel. Breathtaking scenery en route to Valley of Flowers. You'll leave for the Valley of Flowers after an early breakfast. This is a largely easy climb. A 10-km long valley full of unique and beautiful flowers await you when you reach. This sight is made even more amazing by the Pushpawati stream that runs through the middle of it. You will trek back to Ghangaria after taking in this view and spend the night there. Overnight at Ghangaria in hotel. 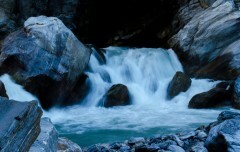 Cross gushing waterfalls, river streams and boulders. You'll trek up steep slopes to Hemkund Sahib, which is at an elevation of 14,202 feet. It is a more difficult climb compared to the other days. Hemkund Sahib is a Gurdwara that lies on the banks of a glacial lake, surrounded by seven snow-capped mountains. This is an awe inspiring sight. You will start trekking back to Ghangaria by afternoon and stay the night there. Overnight at Ghangaria in hotel. You will trek downhill to Govindghat. It is a fairly easy trek and will take you about 4 hours. At Govindghat, you'll board vehicles and travel to Badrinath to visit the holy temple. Spend some time at the Badrinath temple and drive back to Govindghat. However, this visit to Badrinath is subject to good weather and road conditions. A final call will be taken by the tour leader on the day of the visit. If a visit to Badrinath is not on the cards, you can spend the rest of the day exploring the picturesque little town of Govindghat. Overnight at Govindghat in hotel. Snow-capped mountains on the trek. In the morning, you will be driven back to Haridwar or Rishikesh. You can have lunch on the way. You will reach Haridwar by evening. Your trip ends here. You'll spend the night at Hotel Mangalam or similar hotel in Govindghat. You'll be staying in deluxe rooms with attached washrooms on a triple/quad-sharing basis. Today's meal package includes only dinner. You may visit any of the restaurants en route to Govindghat to have additional meals at an extra cost. Stay at Hotel Mangalam or similar hotel at Govindghat. 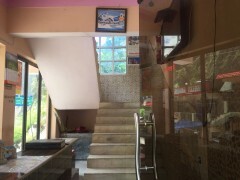 You'll spend the night at Hotel Holiday Inn or similar hotel in Ghangaria. You'll be staying in deluxe rooms with attached washrooms on a triple/quad-sharing basis. Today's meal package includes breakfast, lunch and dinner. All meals will be vegetarian. 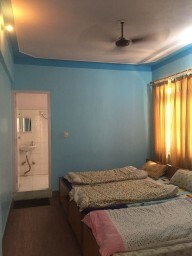 Stay at Hotel Holiday Inn or similar hotel at Ghangharia. 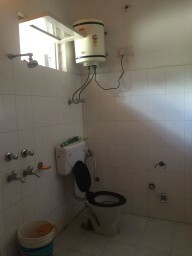 You'll spend the night at Hotel Mangalam or similar hotel in Govindghat. You'll be staying in deluxe rooms with attached washrooms on a triple/quad-sharing basis. Today's meal package includes breakfast, lunch and dinner. All meals will be vegetarian. Today's meal package includes breakfast before departure. You may visit any of the restaurants en route to Haridwar to have additional meals at an extra cost. Haridwar is well connected by means of road and rail. There are many trains connecting Delhi and Haridwar. Govindghat is located at an approximate distance of 300 km. Participants may either opt for transport arranged by the operators or they can also make their own arrangements.